Onions are easy. As long as they’re not in direct light, they can be stored on a countertop, like garlic. Keep them away from potatoes, though: They cause spuds to sprout. Potatoes belong in a paper bag in a cool, dark place—but not the fridge. Carrots go limp faster when the greens are left attached, so trim them before refrigerating. Unpeeled carrots last longest in an unsealed baggie in the crisper drawer. Tomatoes should ripen on the counter. If they’re ripe, a few days in the fridge will extend their life without diminishing flavor. Celery should be refrigerated and wrapped tightly in foil, not plastic. If it’s cut, refrigerate it in a closed container filled with water. Cucumbers prefer room temperature and will last only three days in the fridge. Like a lot of vegetables, they also spoil faster when exposed to ethylene, a gas exuded by onions, apples, bananas, and tomatoes. A healthy cottage industry has been created around outdoor gear for dogs, but why should canines have all the fun? Cat Camp’s Cat Tent breaks new ground. Measuring 21.5 inches wide and 14 inches tall, it has all the poles, flaps, and zippers you’d find on a full-size tent. You even have to pitch it. There’s a tarp to protect against rain, a removable microfiber floor pad to keep kitty cozy, plus a secret rear catch that a clever pet can use as a second exit. 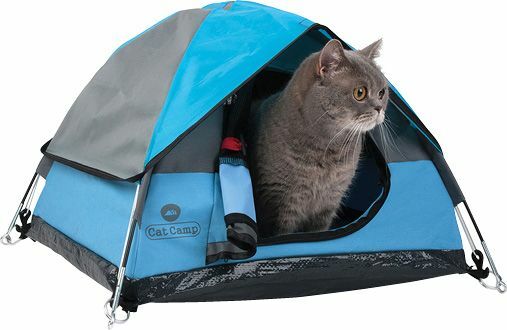 Manufactured in Australia, the Cat Tent should begin shipping in two or three months.